Photographers have a need for a sketchbook. Primarily we use them in a different way than other artists. We may sketch out a lighting diagram, draw out a storyboard, paste and collage so to create a mood board. We'll write - a lot - about things such as gels, lighting, thoughts about what we want to shoot and of course may paste in final images, Polaroids, clip tests and a variety of things. All this said many photographers also explore experimental techniques in sketchbooks, and explore things like collage and painting. Henri Cartier Bresson as well as Saul Leiter both moved on from photography to painting due to their work in sketchbooks. For me I use them like any other photographer, though more and more I've been experimenting. Now one issue that I had with other sketchbooks is that as a photographer I paste a lot into my books. This has led to some of the older sketchbooks having their signatures separate from the spine. 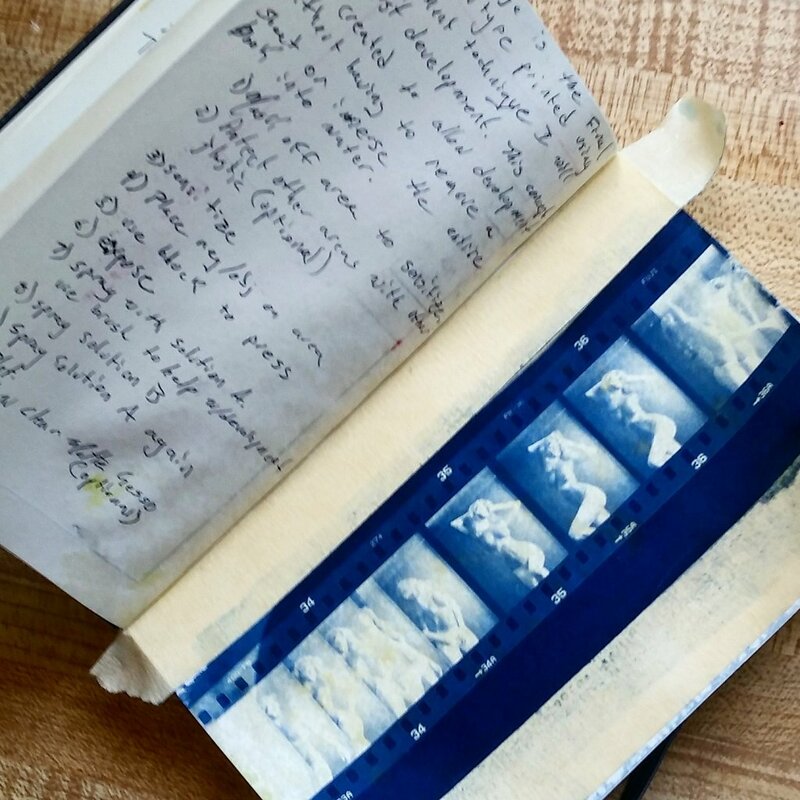 This has led me to explore methods of directly creating a photograph onto a page in my sketchbook /journal without having to remove the sheet or dunk the entire book into a chemical bath,. After a little research I decided on the cyanotype process. I shoot a lot of black and white, so either negatives or creating digital negatives would be no issue. The cyanotype process in chemically "soft" and wouldn't stress the structure of the paper. The fact that the developer for cyanotype is just water as well as the fixing agent meant that instead of say tray development, I could perhaps mist with a spray bottle. Since I already was using the Leda sketchbook, I thought to give this concept a try. The reason I chose to work with Leda sketchbooks is that so far they have proved quite flexible for me. I don't have to paste in sheets to create a storyboard, and the paper is wonderful to work with and write upon. The question was could this crazy idea of directly creating a photographic print onto the paper of the Leda would cause any significant damage to the paper, or even possible using a method of development that to my knowledge has yet to be documented. Well folks the answer is YES; you can chemically abuse your Leda and print a photo quite easily! As you can see in the image below, I've managed to successfully coat and expose the paper of your Leda Sketchbook. Now sure, a Prussian Blue vs a traditional silver print isn't exactly the same, but it is something unique and new for my sketchbook. - Sensitize paper - you can use either a commercial cyanotype kit or mix your own chemistry. Since the paper is only 81lbs you don't need to use a lot of sensitize. Less than a milliliter will easily coat an entire sheet of the pocket edition. Allow 20 minutes to dry. - Place negative or if you are doing photograms object onto the sheet. I use a glass block to press the negatives into the page as the sketchbook is too thick for a contact frame. - Once exposed, use a spray bottle and mist the surface of the paper with water. The print will turn blue. You could alternatively try using a waterbrush to develop the image. - Once developed you can intensify by spraying with a solution of Hydrogen Peroxide. I use a 3% solution in a spray bottle that I buy at my local drugstore. This step is optional. - If you intensify, spray again with with water. Spray until the paper is saturated to remove any undeveloped chemistry. - Allow to dry. Once dry if you want to protect the print simply coat with clear gesso or clear gel. I personally like Liquitex. Feel free to try this yourself. Sure it's easier to just edit and print out a sheet in Photoshop, but the act of creating an actual photographic print in my sketchbooks makes me feel like some made scientist or alchemist again. Experiment and improve on this technique!